This video will give you an overview of all the necessary steps to take. You willl have a working system with Qtile desktop. We follow the guide of this page and will compare it with the Arch Linux installation page. We show you what settings I use in VirtualBox to have an EFI boot. There is a tutorial about all the settings of VirtualBox in arcolinux.com. We use the possibility to group our virtual machines and the clone option to have different virtualboxes from each phase. Your bootscreen will tell you if you are on MBR/BIOS or UEFI. Logo of ArchLinux is MBR/BIOS. If you boot up with 5 lines then you are in UEFI. Then we follow the guide till we are at Phase 4. We have the standard lightdm, lightdm-gtk-greeter and lightdm-gtk-greeter-setttings installed but we still do not have a desktop. Qtile provides a config to work with and we decide to take a look at how it looks without theming and tweaking. We will copy/paste over the default config of the developers. Lateron we decide to get all the needed packages from the ArcoLinuxD github. In the video we will go over all the scripts and select them one by one and discuss them. We analyze the scripts and install the bare minimum. We can run script 400 distro specific since it uses the Arch repositories and all we need is pacman. 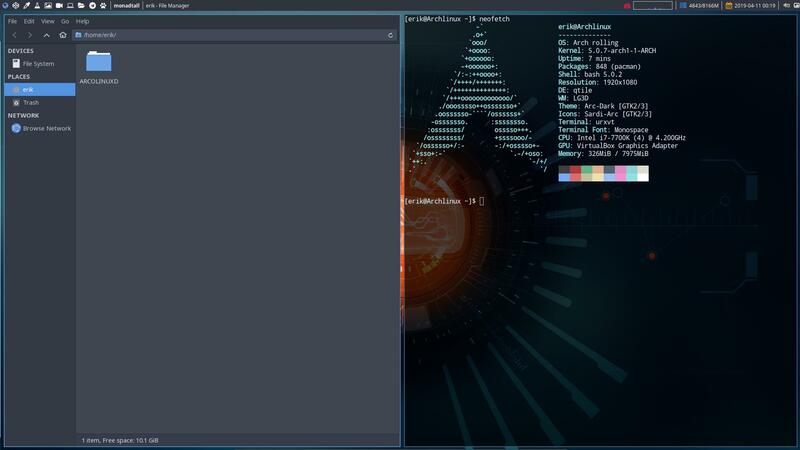 Script 500 needs an AUR helper like yay or trizen and that is not installed on ArchLinux. We use this article to install yay. Script 600 is required since it contains all the ArcoLinux packages but Arch Linux does not know any of our ArcoLinux repo’s. We will only import the configuration of Qtile. That is the most important. We will the other packages later. Lets first check a minimal config of Qtile. We need to copy/paste the content from /etc/skel to our home directory. Then we reboot and talk about the issue we are currently experiencing of the 90 seconds countdown. UNFORTUNATELY the video was cut off due to the fact that the keyboard shortcut to reset the virtualbox is the same shortcut to pause simplescreenrecorder. luckily We were almost at the end. 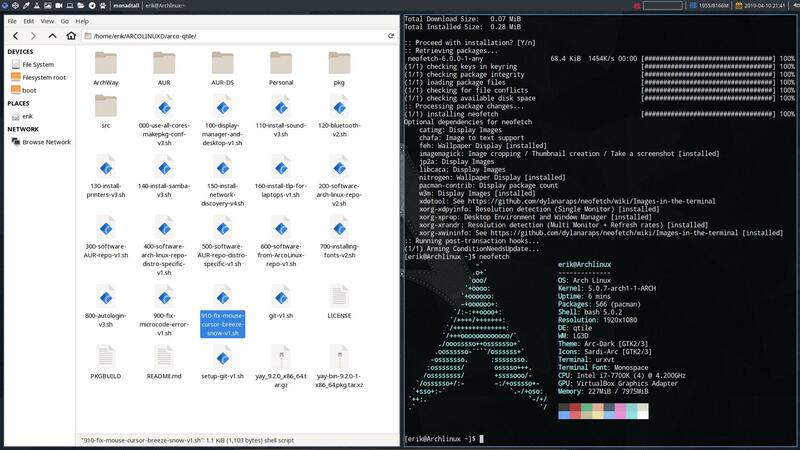 We resolve the conflict between lightdm and arcolinux-lightdm by removing the standard Arch Linux package. You will see the conflict if you try to run script 600. After removing these packages you can restart script 600 and there will be no conflicts. Then you decide if you run the rest of the scripts like bluetooth, printers, script 200, 300, … or just install one application at a time on a need to have basis.